CINCINNATI -- U.S. Secretary of Veterans Affairs Robert McDonald is a longtime Reds season-ticket holder, Reds Fantasy Camp attendee and a former Cincinnati-based Proctor & Gamble chairman and CEO who watches MLB.TV to track his favorite team while serving on the Obama Administration. McDonald was back home on Saturday, and so was Major League Baseball's All-Star Week spotlight. That, after all, is how you look at it when you are from Cincinnati, home of the first franchise. "This is where Major League Baseball started," McDonald said. "I think everyone here recognizes that and has a deep love in their hearts for baseball." McDonald, a retired Army captain about to complete his first year as a cabinet member, was among many dignitaries who attended an important afternoon event that will have a lasting benefit to U.S. military veterans, as a tie-in to the 86th All-Star Game presented by T-Mobile on Tuesday. 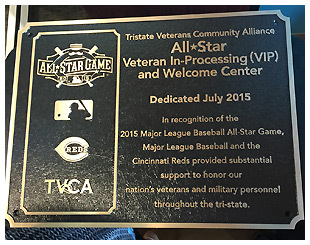 As an extension of MLB's Welcome Back Veterans initiative, MLB and the Reds, in conjunction with the nonprofit Tristate Veterans Community Alliance, unveiled upgrades to an existing space at the CityLink Center to create a new veterans reintegration center. The new center will help some of the thousands of veterans in the Greater Cincinnati area facilitate a successful transition and reintegration into the community through various resources, including financial planning, job readiness, peer coaches and referrals to qualified community organizations/services based on the needs of the veteran and his or her family. "It's great to be in Cincinnati -- this is my home, and it's great to be back with Bob [Castellini, the Reds' president and CEO], my dear friend," McDonald said. "When I ran the Proctor & Gamble, Bob and I served on several committees together. I think the Castellini family is doing a wonderful job in Cincinnati, and again Cincinnati is leading the way with this Veterans Center, in showing how much it cares for its veterans coming back. I'm thrilled to be a part of it." In addition to McDonald and Castellini, dignitaries at the event included 1963 All-Star pitcher Jim O'Toole of the Reds; Tom Brasuell, MLB vice president of community affairs; Major Gen. (Ret.) Leonard Randolph Jr., chairman of TVCA; CityLink executive director Johnmark Oudersluys; Donald Cooke, senior vice president of philanthropy for the McCormick Foundation; local government officials and various U.S. military veterans. MLB presented a bronze plaque that will be on permanent display at the facility, attesting to 2015 All-Star Week's lasting legacy in a way that makes a difference. "This reintegration center couldn't have come at a more important time," McDonald said. "Our veterans have been doing some really heavy lifting for our country. We've been fighting a war for over 15 years. They've been defending our freedom, they have preserved our opportunity to prosper. And now, annually about 250,000 service members will be transitioning to civilian life. "Having done this once before myself, I know it's not easy. There's a lot of trepidation, a lot of anxiety. And there's potential that those veterans could face unemployment, or even worse, homelessness. We at the V.A. have got to make sure that doesn't happen. It's through partnerships like this that we can do it." While helping veterans is his aggressive mission, McDonald was happy to talk a little baseball. "Every young man's dream is to be associated with Major League Baseball, and I'm indicative of that," he told the crowd. "A couple of years ago, I had the opportunity to attend Reds Fantasy Camp." It was a 60th birthday gift from his son, Rob, and his family. "We went together, we roomed together," McDonald said. "But there are downsides to going to Reds Fantasy Camp. I couldn't walk for several weeks afterward. My son put all the pictures on his Facebook page, talking about my batting average. But probably worst of all, on his Facebook page, he said how much he hated the fact that our hotel room smelled like Bengay every night. "It's something I always had wanted to do, and to be able to go with my son was really unique, because I ended up being his baseball coach or manager throughout his life. To be able to play on the same team, be on the field at the same time, was a real thrill." McDonald said one of the "downsides of accepting this role in Washington, D.C., is that I am not able to use my season tickets for Reds games." But he has a secret weapon in MLB.TV, so that he can watch all their games streamed live anywhere he goes. "I do. I watch MLB.TV to see what the Reds are doing," McDonald said. "I also hope the Nationals play the Reds every game, because that way I can see the Reds play. But I don't get to see as many games as I would like because I am usually traveling. But when I do catch up, I look forward to it."